A chalazion is a slowly developing lump that forms due to blockage and swelling of an oil gland in the eyelid. It is more common in adults than children and occurs most frequently in persons 30 to 50 years of age. Initially, a chalazion may appear as a red, tender, swollen area of the eyelid. However, in a few days it changes to a painless, slow growing lump in the eyelid. A chalazion often starts out very small and is barely able to be seen, but it may grow to the size of a pea. Often times they may be confused with sties, which are also areas of swelling in the eyelid. A sty is an infection of an oil gland in the eyelid. 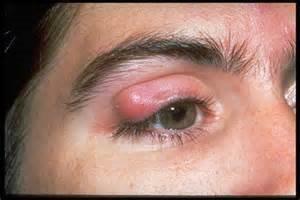 It produces a red, swollen, painful lump on the edge or inside surface of the eyelid. Sties usually occur closer to the surface of the eyelid than do chalazia. A chalazion is generally not due to an infection, but results from a blockage of the oil gland itself. However, a chalazion may occur as an after-effect of a sty. Most chalazia disappear without treatment in several weeks to a month. However, they often recur. Rarely, they may be an indication of an infection or skin cancer. A chalazion can develop when the oil produced by glands within the eyelids, called the meibomian glands, becomes thickened and is unable to flow out of the gland. The oil builds up inside the gland and forms a lump in the eyelid. Eventually the gland may break open and release the oil into the surrounding tissue causing an inflammation of the eyelid. Evaluation of the lid margins, base of the eyelashes and oil gland openings using bright light and magnification. Using the information obtained from testing, your optometrist can determine if you have a chalazion and advise you on treatment options. Many chalazia require minimal medical treatment, resolving on their own in a few weeks to a month. To facilitate healing, warm compresses can be applied to the eyelid for 10 to15 minutes 4 to 6 times a day for several days. The warm compresses may help soften the hardened oil that is blocking the ducts thereby promoting drainage and healing. Lightly messaging the external area of the eyelid for several minutes each day may also help to promote drainage. A clean soft cloth dipped in warm water and wrung out can serve as an effective compress. Remoisten the cloth frequently to keep it wet and warm. Once the chalazion drains on its own, keep the area clean and keep your hands away from your eyes. If the chalazion does not drain and heal within a month, contact your eye doctor. Don’t attempt to squeeze or drain the chalazion yourself.